Sponge Bob is better known than a plumbob, but at the National Building Museum you’ll see the latter. Bordering the museum on 4th, 5th, F and G Sts. NW, the Boundary Markers are 10-feet tall with a brick base and concrete for the workers and urn. Atop the marker is a hook that holds a hidden plumb bob inside an urn held by six construction workers. It symbolizes how all buildings are measured when constructed. 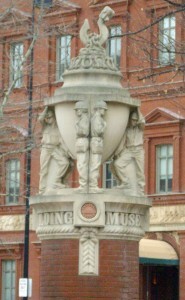 Created in 1968 by American sculptor Raymond Kaskey, whose American Law Enforcement Monument is just down the street, the markers have workers looking different to show tradesmen come from different backgrounds. A plumb bob comes from the Latin term plumbbub for lead weight. The heavy weight goes straight down because of gravity. A plumbob is placed in an urn of oil so it doesn’t move. All measurements of a building from it because it’s centrally located. This entry was posted in Attractions and tagged Best Washington DC walking tours, Boundary Markers, free Washington D.C. attractions, National Building Museum, Photo by Rick Snider, plumbob. Bookmark the permalink.